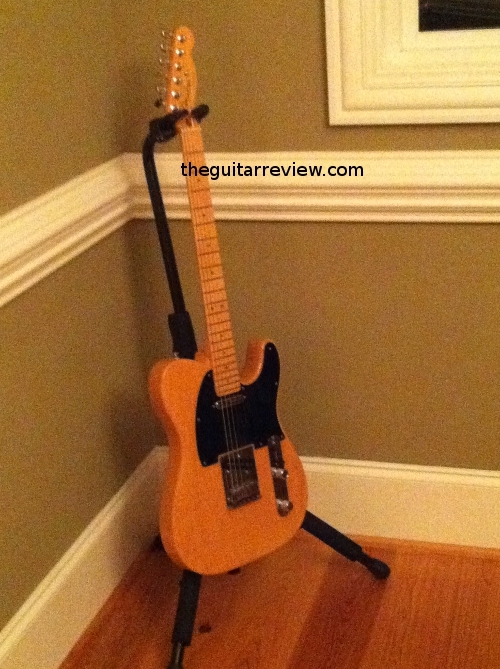 The Fender Deluxe Ash Telecaster (Tele) review: 6 years with a USA-crafted pinnacle instrument! I started making music again in 2004, after a decades-long hiatus. By the beginning of 2005: not only had I begun playing seriously again, I was actually teaching myself to record and I was expanding my instrument library by leaps and bounds. My brother Will has been one of my strongest musical supporters, even from the first time I picked up a guitar at 12 years old. He purchased all my funky little early albums when they released, and continued his support in so many wonderful ways. One day I walked to the front porch step and there was a big box there. He had given me a gorgeous USA Fender with which to make music. Thank you, Will. “Blondie” will forever be a part of my sound. I’ve since used my American Deluxe Tele to record countless pieces and even gig small venues. This instrument is a part of me, a part of my sound, and a part of the thrill of creating and playing music. Quick Opinion: Everything about the Deluxe Ash Telecaster is awesome. It’s a “pinnacle” instrument, comparable to any custom shop or “old school build” Tele I’ve ever played. Playability: The neck has a silky feel that is not the same as the satin feel of the Mexico Standard Teles and the American Special Telecasters. It’s difficult to describe, but it’s like a perfect balance between silky smoothness and sensual touch. It is almost a gloss to the eye – but doesn’t grab the skin like gloss can (once you begin to play hard or for long periods of time). It’s beautiful tinted silkiness. I enjoy the medium-jumbo frets. They’re not huge, but they’re not the “fretless wonder” either. They’re comfortable and excellent. The neck is a 9.5″ radius. Nice! I love the hand-rolled edges of the neck. The frets were superbly dressed and in perfect condition. Level, smooth, no jags on the paws as you navigate the fretboard. What more can a guitar player want? It is an extension of my heart’s music – playing out into your ears through that neck. Wow. The body feels like a good old Telecaster. Medium weight, perfectly routed on the edges (the blonde version does not have binding, some other deluxe models do), and the picking arm feels right at home on top of that ol’ Ash slab. It’s a standard Tele shape, so it is what it is, just the feel is great from the hand-applied finish. I do like the bridge. There’s a lot to like with brass three- or six-saddle Tele bridges – but to be honest, this block-saddle bridge works great and intonates well. The bridge is not overly tall and doesn’t often interact with the picking hand. Tuning is relatively stable. My Deluxe Ash Tele has Ping-style tuners – I personally prefer the vintage Kluson-style tuners, but these work really well and stay in tune as much as I need them to. I think locking tuners would have been good – but to be honest, this Tele behaves in a consistent way even after hours of play. No more or less out of tune than you would get with Ping tuners on a saddle-bridged Tele. The new (as of at least 2012 – don’t know when it started) Fender Deluxe Ash Telecaster has staggered locking tuners on its compound radius neck. Sounds great to me! Overall, it plays like a dream: partly because of the feel; partly because of the weight balance; partly because it just fits the body and hands like the genius instrument it is: Simplicity and power, all at the same time. No wonder many of the greats still play similar Telecasters. Pickups and Electronics: The electronics are about as good as it gets without having a boutique manufacturer custom make pots, caps, jacks, switches, and wire for you. They’re good, solid Fender, the soldering is great, and the wires aren’t cheap stuff. The caps are basic Fender stuff – but they make the right sound – I left mine alone and didn’t touch any of the circuit mods from the factory. The pickups are stellar. Nicely-wound, pretty much as noiseless as a great humbucker, and give me a satisfying Telecaster sound that can twang, spank, and can rock hard in pretty much any genre I choose to play. It even sounds delightful with plain tubes in warm (not drive) mode in a clean channel or clean model on my computer interface. I’ve recorded extremely hard versions of Clapton-esque drive to metal to jazzy to new age to prog rock to classic rock (sorry, I don’t have country in my repertoire yet – but stay tuned! When I do noodling covering country stuff, this guitar brings it on in DROVES!). The pickups are Fender’s SCN pickups on both bridge and neck (neat little insignia to let you know…). They’re Samarium Cobalt Noiseless pickups: and they’re an awesome addition to Fenders’ Vintage Noiseless, Vintage Hot Noiseless, and N3 pickups (The current crop of deluxes use the new N3 pickups… you’ll have to get an older model to get the SCNs). These totally flail down the aftermarket noiseless Tele pickups – when it comes to the music I play. The controls are: master volume, master tone (a no-load tone control – I put these on most of my modded Fender guitars and basses – the circuit completely bypasses the tone circuit when the tone knob is turned all the way to ten). Tone woods: I love ash. The other tone woods are good, too, but if I can get a Fender in Ash, it makes my ears happy. The wood is excellent and actually kind of light under the blonde finish (light as in lighter than most ash grains). The snappy maple neck and fretboard of my Deluxe Tele is perfect for sounding “like a Telecaster.” Nicest “slab” guitar in town! Hand-crafted excellence: Wow: The electronics were done as though it was the last and best Telecaster on Earth. Really. Very well-done, attention to detail, and a good instrument made on a good day at a great factory. Quality: I think I’ve already alluded to the quality of my Deluxe Tele in the previous paragraphs, so I’ll abbreviate this section of this review. My Telecaster is the best-made Fender I’ve ever played. It’s on par with my Bozeman-made Gibson acoustic and my two Gibson Standards. They’re truly the pinnacle of simple, playable hand-crafted art. There were zero issues with my Tele. It still plays and sounds perfectly wonderful. Value: My Fender Deluxe ash Telecaster came with a deluxe G&G USA case, just like the old stuff – just black tolex instead of tweed. I love the case. It’s great for around the house and short trips to small gigs. But I like the case enough to want to take care of it. I do have one other case I use (shared among my Fender Strats and Teles) that is the new SKB TSA-approved molded high-tech case. The newer Deluxes come with the SKB case standard and no longer offer the G&G vintage-style case. In either event, new or old, you get a great case for your awesome Telecaster. Overall value? They were around $1300 when Will bought mine. They’re now a few hundred more than that. They’re worth every dime, maybe even a little more than $2k. If you’re looking for a bargain instrument, don’t look at customs and deluxes. BUT: if you want a deluxe or custom instrument that is a bargain in its ranks: The Fender Deluxe American Ash Telecaster is at the top of the list: affordable and so very close to a custom-shop guitar in overall execution and quality. Features: The features. Great! On my particular Tele, the position markers are abalone. They’re a bit fainter than black dots, but I like them a lot. The newer Deluxes have standard black dot position markers… Tomato-tomahto. Long on features, short on price. Wishes: Locking tuners. Fender already beat me to it.